KUALA LUMPUR: Former Olympic swimmer Leung Chii Lin does not regret her decision to step away from the national team earlier this year, having achieved everything she set out for. The 21-year-old stamped her mark as a junior with a clean sweep of 12 gold medals when she made her first appearance at the MSSM (national schools) meet years ago before going on to establish herself as one of the country’s top woman swimmers. Sabah-born Chii Lin said that getting to swim at the Beijing Olympics in 2008 was her ultimate goal. “As a swimmer, you want to be able to say you swam at the Olympics before and I think that was the most I could aim for realistically ... the highlight of my career. “I’ve achieved everything else, to swim at the World Championships (Rome in 2009); SEA Games (Korat in 2007, Laos in 2009 and Palembang in 2011); Commonwealth Games (New Delhi in 2010); and Asian Games (in Guangzhou in 2010). “And I never neglected my studies, not even when I was still swimming ... and that hasn’t changed. “I do not regret quitting the national team at all,” said Chii Lin, who finished 48th out of a field of 90 when she swam the 50m freestyle at the Beijing Olympics. 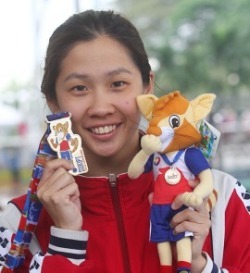 Chii Lin showed that she is still a swimmer to be reckoned when she contributed two gold medals to her alma mater at the National Higher Education and Institution Games (Sukipt) the at National Aquatic Centre in Bukit Jalil yesterday. Chii Lin, who is a second year Sports Science student at Universiti Malaya, won gold in the women’s 50m breaststroke and the 4x200m freestyle relay team. She also claimed a silver in the 50m butterfly final behind fellow Sabahan Chui Lai Kwan. Chii Lin has collected four gold medals so far, having triumphed in the 100m freestyle and 100m breaststroke on Tuesday. Former national swimmer Lai Kwan continued to make a big splash by romping to three more gold medals, bringing her tally to six after two days of competition. Lai Kwan, swimming for Universiti Putra Malaysia, won the 200m freestyle, 200m individual medley and 50m butterfly.